Sorry to hear about the sailfin. Give the blennies a lot of hiding places in DT, where they can establish territories. PVC pipe pieces work great, either with the end capped or not capped. Once they have a tube to hide in, their territories get smaller. Kevin, here is what the QT looks like after adding a barnacle and 2 pvc pipes. Does that look like enough hiding places to you? I think your QT looks better than many display tanks I have seen. And yes, that's plenty of hidey holes. Thank you Eric. 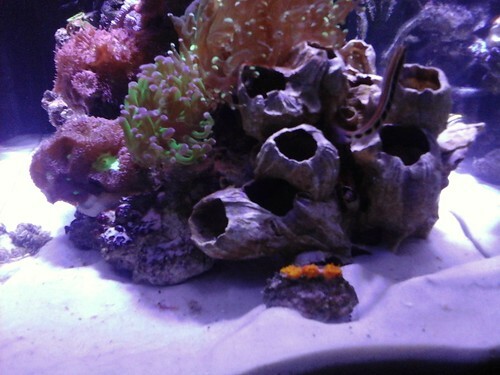 I did have to put the Klausewitz blenny in time-out in a baby fish keeper. It was biting the smaller Linear blenny which has a similar look. I am thinking that both of them should not go into the seahorse DT but I am not sure how to handle that. Maybe 1 can live in the QT permanently. The other 5 blennies are doing well together. Sorry to hear about the sailfin. Don't be hard on yourself. Most likely, the fish was stressed from either being collected or shipped. I agree, the QT has plenty of hiding places and looks great! 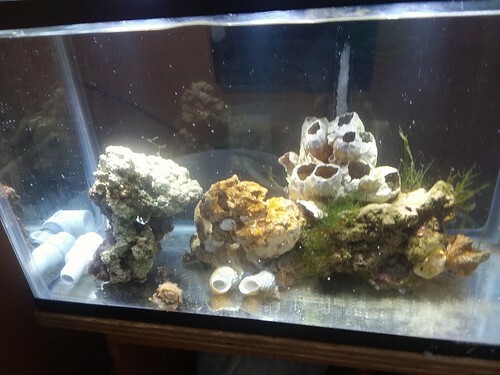 I'd remove the rocks and barnacles if you add copper, and replace them with pvc pipe pieces just big enough for the blennies to fit in. That way, you can use the rocks on another set up or your display. How big is your display and QT? If the display is significantly larger, maybe the two "problem" blennies will have enough room to avoid each other. Thanks Kevin for commenting on the QT. I ended up using prazipro and nobody is scratching anymore. I put the klausewitz blenny in a baby fish net as he seemed to be the aggressor. I saw him grab the linear blenny by the neck and shake him plus he went after the striped blennies too. There has not been any more scuffles since. The QT is only 10 gallon and the the seahorse tank is 56 gallons with lots of rock but I decided not to risk it. This afternoon I went back to the lfs and asked if I could trade the blenny for a fish half its worth. They actually refunded my money minus a 20% handling fee. I now have 2 bangaii cardinals instead. Everyone is playing nice now. Great job your tank is beautiful. I love the painting on the back glass. Thanks, it is in memorial to Eve's mate, Adam. I put the klausewitz blenny in a baby fish net as he seemed to be the aggressor. I saw him grab the linear blenny by the neck and shake him plus he went after the striped blennies too. Yikes! Good call on getting him out of there. With that much aggression, it wouldn't matter how big the tank was. That's a good LFS!!!! That is how to get return business!!! I am really pleased Kevin that the lfs did that. Most have a no return policy. With the new changes they have made with carrying captive bred fish and keeping them separate from the wild caught, I will definitely buy fish there again. Good job, making adjustments on the fly. Sometimes we try fish that don't work in our fish community. Then we have to make a call. It sounds like you made a good one! Now, how about some pics? Here is a pic of the QT that the blennies and cardinal fish are in. Of course most of the blennies are holed up hiding. This photo shows a blurry shot of the linear blenny diving tail first into the barnacle hole. In an effort to control multiple tank syndrome (I had 3 tanks set up), I consolidated a 5.5 gallon pico reef with the QT. I moved the 10 gallon QT to next to the seahorse DT and put the contents of the 5.5 reef into the 10 gallon. Now I have an attractive QT and when there are not fish in it, it should be just as easy to maintain as the 5.5, which was super easy. Wow, nice QT! I think some reefers would be jealous. Thanks for the pics. More please! Wow, nice. It's now a DT/QT! I never had luck with coral that needed fed until I came up with this shrimp chalet. 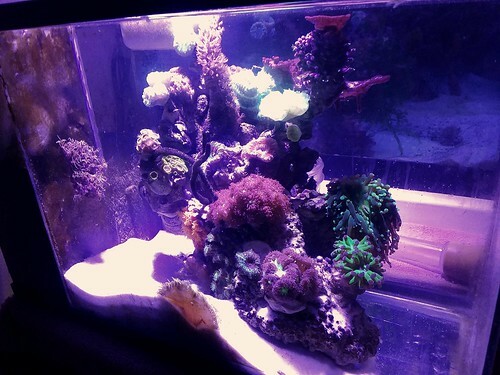 It was a contest tank on another forum where we were suppose to run a pico, (3 gallons or less) using a container that was not designed to keep fish. It could only have a par LED for light, a heater, and either a small pump or air pump and airline tubing for aeration. Mine was designed to house feeder shrimp for the seahorses. Most of the ghost shrimp have been fed to the ponies but there is still 1 left who is a permanent resident. It was a fun contest even if I did not win and I learned a lot about maintaining a simple system. Lots of food and big WCs, which is easy with small tanks. 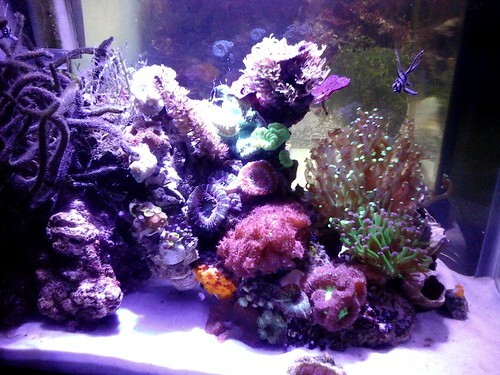 I moved the inhabitants out of the 3 gallon glass cookie jar when the contest ended last March. I hope I don't keep getting bigger every 6 months, ha ha! Today I moved the fish into the seahorse display, everyone except the barnacle blennies. One of them just seemed too small to take a chance on getting eaten by the ponies. They will be cute in the QT/DT. 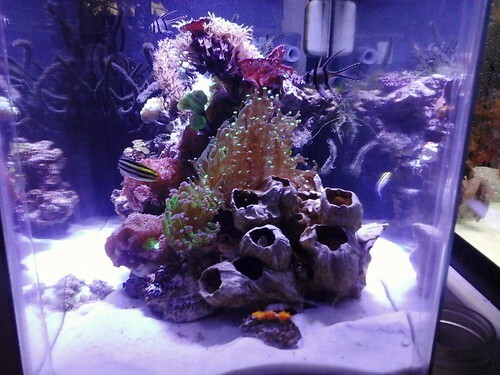 The other fish look happy to have the extra room and seem comfortable. The only one that went in and disappeared is the linear blenny. With so much rockwork it is no doubt holed up in a crevice or cave. Feeding time will probably bring it out. I spoke too soon, I see it. Its down on the bottom in a corner. It looks a bit unsettled but not anything to be worried about. The tank looks nice with the additions without feeling overcrowded or so hectic that the seahorses will be nervous. I will do extra WCs to help the seahorses deal with any immune issues that adding the fish may cause. I am very pleased with how this process has gone so far. I will keep you all informed of any new developments. I can't wait to see this! Let us know how everyone gets along. Here is a video of the fish in the seahorse tank. I hope it embedded but it might be a link. Nice! It looks like everyone is getting along. Also I like the caulerpa tree in the foreground. Yes, they are getting along nicely. Also I added prasipro which has stopped the scratching and twitching. I am cautiously optimistic that this is going to go well. I caught the lined blenny, (Linus) harassing Delilah. He had her cowering and trying to hide behind the grape caulerpa tree. That was it, I grabbed the net, swooped him up and now he lives with the barnacle blennies in the QT. I had not expected that sort of behavior from a lined blenny. The ones I was worried about were the striped blennies, Sir Lancelot and Sir Galahad but they have been model citizens thus far. Linus is an algae blenny though so maybe he was hoping to get some algae off of Delilah. I had hoped with the seahorse garden being so well established that there would be plenty of micro/film algae on rocks and such that Linus would be satisfied...plus I feed emerald entree. O well, it is what it is.